Engaging patients to be proactive in managing their condition, allows patients to actively drive the review of their care, which ultimately improves quality of life. We develop web based solutions that enable patients to do this by completing a simple self-assessment questionnaires online, thus encouraging the early diagnosis of serious complaints or to flag with clinicians the impact of current treatments on their quality of life. The secure web based solution can be aligned to online questionnaire that can be easily accessed and used by patients, allowing for quick and cost-effective assessment. Questionnaires typically take just minutes to complete, the results are then triaged which enables clinicians to make an effective decision on whether further investigation is needed, at a primary or secondary care level. This saves time, potentially reduces costs and may improve care, as it potentially fast tracks the diagnosis of serious conditions or identify patients who may need a review of their medication to improve compliance. The triaging of patients may also reduce inappropriate referrals or consultations, therefore reducing waiting lists for patients require urgent access to treatment. We developed RAPID-P (Rapid Access Patient Investigation & Diagnosis Portal) in partnership with Westcliffe Health Innovations to support the early assessment of stomach cancer across its sister organisation - The Westcliffe Group of GP practices. This innovative Web portal was awarded funding for its development from the Health Foundation, as part of a innovations programme to improve patient care. The RAPID-P assessment portal was used across the six practices of The Westcliffe Group to triage patients with gastrointestinal complaints through a simple online questionnaire that patients completed themselves, before clinician review. The use of RAPID-P established a consistent and reliable two-week referral and four-week definitive diagnostic pathway, in line with NICE guidance NG12. RAPID-P has provided The Westcliffe Group with a low cost and instantly accessible patient-centric tool that is underpinned by clinical evidence and NICE guidance. 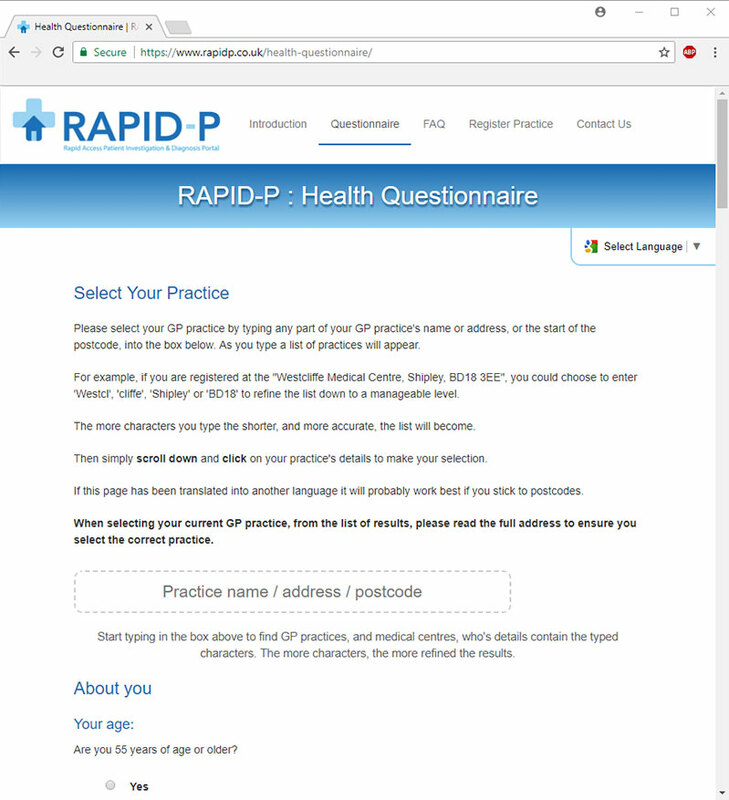 The Rapid-P website, or portal, is designed to encourage people, who have symptoms that may indicate gastrointestinal (gut) issues, to make an appointment for a medical consultation, within the NHS, as well as offer advice on where to find more information.